NAMM 2018: Apogee has updated the MiC, which we first saw in 2011 and then updated to a 96k version in 2014, with a complete overhaul called the MiC Plus. MiC Plus features an entirely new design and promises improved sound quality, dynamic range and adds a built-in headphone output for latency-free monitoring while recording on any device. The microphone still retains its portable form-factor in combination with the professional quality you'd expect from a studio condenser microphone. Setup is simple with MiC Plus selected as your audio interface in your favourite app and also includes three cables for connecting directly to Lightning/iOS, USB-C or USB (Type A) devices. 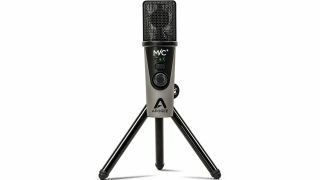 We will see Apogee at this year’s NAMM show, but if you cannot wait that long, the MiC Plus is available now priced at £239 RRP inc VAT. For more information please go to the Apogee website.